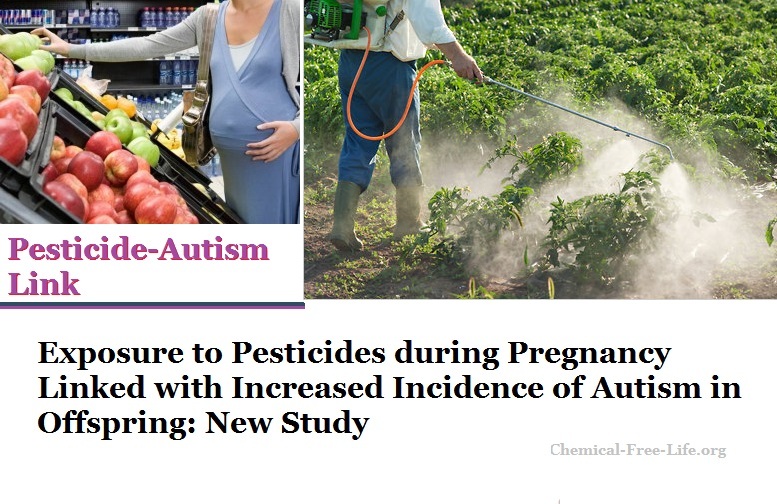 Scientists involved in the largest study to date examining the effects of pesticide exposure during pregnancy have concluded that exposure to pesticides during pregnancy appears to be linked to the incidence of autism in offspring. The researchers reached this conclusion by analyzing autism registry data in California along with data on pesticide spraying in the state (California is an agricultural state with heavy pesticide use in certain regions). Overall, the study included nearly 38,000 people, with 2,961 cases of autism. The scientists found that women who were pregnant and who lived within a 2,000 meter radius of a highly sprayed area were anywhere from 10% to 16% more likely to have children diagnosed with autism than women who lived in places farther away from sprayed areas. The researchers reviewed spraying of 11 popular pesticides, including chlorpyrifos, diazinon and permethrin (often used to control ticks). When they looked at diagnoses of autism spectrum disorder that also came with intellectual disabilities, they found on average 30% higher rates among children who were exposed to the pesticides while in utero. Exposure in the first year of life increased the risk of autism by up to 50% compared to those not exposed to certain pesticides. Risk of autism spectrum disorder was associated with prenatal exposure to glyphosate (odds ratio 1.16, 95% confidence interval 1.06 to 1.27), chlorpyrifos (1.13, 1.05 to 1.23), diazinon (1.11, 1.01 to 1.21), malathion (1.11, 1.01 to 1.22), avermectin (1.12, 1.04 to 1.22), and permethrin (1.10, 1.01 to 1.20). For autism spectrum disorder with intellectual disability, estimated odds ratios were higher (by about 30%) for prenatal exposure to glyphosate (1.33, 1.05 to 1.69), chlorpyrifos (1.27, 1.04 to 1.56), diazinon (1.41, 1.15 to 1.73), permethrin (1.46, 1.20 to 1.78), methyl bromide (1.33, 1.07 to 1.64), and myclobutanil (1.32, 1.09 to 1.60); exposure in the first year of life increased the odds for the disorder with comorbid intellectual disability by up to 50% for some pesticide substances. Findings suggest that an offspring’s risk of autism spectrum disorder increases following prenatal exposure to ambient pesticides within 2000 m of their mother’s residence during pregnancy, compared with offspring of women from the same agricultural region without such exposure. Infant exposure could further increase risks for autism spectrum disorder with comorbid intellectual disability. The researchers said the results point to two possible periods during which developing babies might be vulnerable to the neurotoxic effects of pesticides: while in utero and after birth. The researchers controlled for the effect of prenatal exposure when they measured risk among infants in their first year of life, and they similarly also adjusted for the effect of exposure after birth when they calculated the risk for exposure while the mothers were pregnant. Babies exposed in their first year of life seemed to be at higher risk of developing autism with accompanying intellectual disabilities. Solution: Though the study focused on ambient pesticides, as we recently reported, people may be exposed to pesticides not just through spraying but also by eating produce that’s been treated with the chemicals, so avoiding these fruits and vegetables may be another way to lower risk. The Environmental Working Group recently published its annual list of the most pesticide-heavy produce, as well as those that have fewer pesticide residues. Choosing organic produce can help, too. Journal reference: von Ehrenstein, O., et al. (2019). Prenatal and infant exposure to ambient pesticides and autism spectrum disorder in children: population based case-control study, BMJ, 364:l962. Next Food Additive Hinders Flu Vaccine?